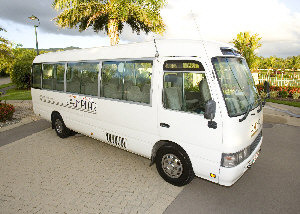 Exemplar Coaches & Limousines provide excellent value transport services between Cairns, Palm Cove and Port Douglas accommodation. The longest established Coach Company in the area, Exemplar Coaches & Limousines offers a direct door to door service for airport transfers. On arrival at the Cairns Airport, you will be warmly greeted by one of Exemplars’ experienced drivers who will be holding a sign with your name on it. Exemplar does not have scheduled departure times from the airport, once your fellow travellers are gathered and assuming your bags come out reasonably quickly, you will be on your way approximately 20 minutes after aircraft arrival-time for domestic flights (it may be up to an hour for international flights because of customs and other formalities). The trip from Cairns Airport to your Port Douglas accommodation normally takes around 60 minutes in a limousine and around 75 minutes by coach. Times to your Palm Cove accommodation are around 25 and 30 minutes respectively. If you have booked a private limousine or a sole-charter, you will be on your way as soon as you are ready. 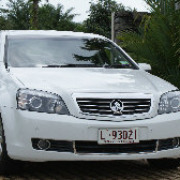 Return transfers from Port Douglas and Palm Cove are also available. Luggage: ample space in routinely-towed trailer. However, please advise if you have excess or oversize items so that alternative arrangements may be made if necessary. Luggage: three standard suitcases. If you know that you will have more that this please liaise with us early; it may be possible to carry your extra luggage in a coach that is bound for the same destination at the same time. This will be done at no extra charge. Baby capsule and/or booster seat on request (free). Luggage: The caged area at the rear of the vehicle can carry the luggage that conforms to regular airline allowances. If you know that you will have more, please liaise early and we will hitch a luggage-trailer at no extra charge. Luggage: three standard suitcases. However, if you have more, that 's not a problem. There are a couple of no-cost options. - We can hitch a stylish trailer to the Super Stretch. That can carry enough for nine, even if everyone has a golf bag. There is no extra charge. - Or put your extra luggage in one of the coaches that is travelling to the same destination at about the same time. Limited destination; but anywhere in Port Douglas or Palm Cove is very achievable if you let us know early enough. Passengers: Whereas normal stretch limousines seat only seven passengers, our super-stretch will comfortably seat nine (one in the front alongside the driver). That means there is ample room to indulge a number of friends, or to spread out in privacy as a couple. - Please advise your flight arrival/departure details including flight number on booking. Bookings should be secured at least 24-48 hours prior to departure to ensure a coach is available to meet you on your arrival and your place is confirmed. - Children aged 2 -11 years are at the child rate. Transfers seamless - van waiting at appointed hour. Great service. Excellent pick up at Cairns, driver stopped on coast road to allow us to take in the view. Timing on return was a little tight, because of number of pickups and queue at airport for check-in. Thanks for your service. 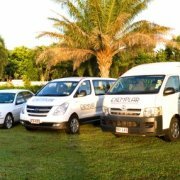 Great transfer to and from Palm Cove. Good value for money. We had a wonderful driver who entertained us the whole trip!! Travstar were excellent from the very first contact. Travstar were excellent from the very first contact. Would highly recommend them to anyone wishing to travel to North Queensland and beyond. Many Thanks to all at Travstar for your excellent service. Drivers were friendly and informative. Vehicles were spotless and well maintained. loved the Reef Club, handy to beach, great managers and the room was perfect for me. Daintree trip excellent too, great guide. However, Poseidon trip was too rough, 30 knot winds, so not very well at all. Did get a brief look at the reef and will try it all again one day. Thanks for everything, plus the tan! Thank you for arranging this holiday. Everything went to plan and the resort was great. Had a wonderful time and would certainly book another holiday with Travstar. Friendly and polite, on time and efficient. Drivers both ways were helpful, friendly and polite, on time and efficient. My driver, Chris (I think that was his name) was very friendly and helpful. Appreciated that the drivers were on time, even though our plane arrived earlier than scheduled the driver was there to meet us. Both an easy and quick collection especially as we arrived out of hours. The cost of the taxi was exceedingly rasonable considering what we have paid taxi drivers everywhere else in the Country. Exceptional service from booking team thank you! Exemplar were very efficient and were exactly on time. 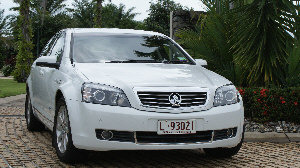 Their Drivers were very presentable and transferred us to and from Port Douglas safely. Great, our plane was delayed but the they came back for us so we didnt have to wait too long. Very friendly helpful drivers. 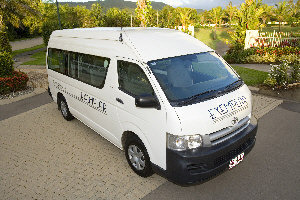 Transfer to Port Douglas was excellent had great driver in a small air cond Mercedes bus. Transfer out not so good early start long wait at airport larger mini bus no driver interaction. Have used this service before and will use it again. Comfortable airconditioned transport with pick up and drop offs on time, no hassles, have used this service before and will use it again. Hi guys, well once again you have made our holiday an absolute pleasure, with organising our complete holiday experience from airport transfers to accommodation. This is the third time we have used your services to head to Port Douglas and we could not be happier! We would and have recommended you to family and friends. It was nice to be met at the airport and the driver was friendly. Next time I will book the shuttle both ways (to & from the ariport). It would be good if we could get a discounted fare for a return trip. Great service both with the email contacts I had and with the driver himself who picked us up - Roy, he was great! Thankyou for organising such efficient friendly and comforable transfers. Efficient, economical service with friendly driver. Would use again. The driver was great full of information and pointing out places on the way even stopping to show my husband a Wallaby! Overall very good. They were there waiting on arrival, which I was worried about, as organised some time back. they were late picking up, only 10 min odd, but I started to worry if we were missed, but understandable they can be a little late. Would be great to just get a courtesy text perhaps the day before pick confirming day and time is only suggested, for the added bit of service. Drivers were courteous and polite and either on time or early. Great service that I would highly recommend. The drive was longer than I anticipated from Cairns to Pt. Douglas but the transfer was comfortable. Kim at Travstar was fabulous! She was very helpful and explained all our questions in detail! Thank you for booking our transfers and accomodation - everything was superb! Service was on time and efficient with friendly drivers. booking the airport transfers was the best thing to do on this particular trip, it was easy and staff at travstar were exceptional. They were the ones that made it all easy and a very enjoyable trip. Good service, on time, and reliable. We were picked up from the airport and returned there from our hotel in Palm Cove. Both drivers were very pleasant and friendly. Good safe driving, on time pick ups. As there were 4 of us it was a much better option than catching the bus. Met at Cairns Airport on time by a very helpful and knowledgeable Driver. Very impressed. will recommend freely. Thankyou! Pick up as agreed and in time. Transfers on time with very good service from the drivers. Both drivers were on time and they were very careful drivers. Drivers were very helful, prompt and friendly. The driver was very courteous, prompt and helpful. went through without any problems. The driver was easy to find and the transfers went through without any problems. smooth easy and great pickup and return all trouble free and value for money. Good driver gave us a run down on the area on the way out to accomodation. Did the job effectively. Picked up on time. We had a couple different drivers as we changed vans once, most were happy and friendly... one we had seemed he would rather be somewher else rather than working.... but all in all ...was ok. Very knowledgeable driver - found out a lot about the region during the drive. Top Marks!! Buses were on time. Driver friendly and helpful. Its a litttle pricy for what it is but everything was fine. We travelled quite comfortably to our hotel. Had the whole bus to ourselves. Driverwas waiting for us on arrival. Very easy and convenient. Their service was prompt and professional.The driver was very helpful with the local topograph and places to go and meet.Excellent service. Very good operator who helped us every step of the way including taking us to the reception with bags. He was on time and very polite. Just 30 $ for the long trip from Port to Cairns Airport is absolutely worth doing and relaxing as well.